Santaferraro: The customers that we work with tend to have very complex businesses, and because of that, very complex information requirements. It used to be t hat they looked primarily at their structured data as a source of insight into the business. More recently, the concern has moved well beyond business intelligence to look at a combination of unstructured data, text data, IM. There’s just a whole lot of different sources of information. The idea that they can have some practices across the enterprise that would help them better manage information and produce real value and real outcomes for the business is extremely relevant. If you look at the information worker or the person who has to make decisions on the front line, if you look at those kinds of people, the truth is that most of them need more than just data and analysis. In a lot of cases, they will need a document, a contract. They need all of those different kinds of data to give them different views to be able to make the right decision. ... I’d like to think of it as actually enterprise IM. It’s looking across the entire business and being able to see across the business. It’s information, all types of information as we identify structured, unstructured documents, scanned documents, video assets, media assets. ... By effectively using the information they have and further leveraging the investments that they’ve already made, there is going to be significant cost savings for the business. A lot of it comes out of just having the right insight to be able to reduce costs overall. There are even efficiencies to be had in the processing of information. It can cost a lot of money to capture data, to store it, and cleanse it. Then it’s about the management, the effective management of all of those information assets to be able to produce real business outcomes and real value for the business. ... Obviously, the companies that figure out how to streamline the handling and the management of their information are going to have major cost reductions overall. Esser: This is really becoming the way that leading edge companies compete. I’ve seen a lot of resear ch that suggests that CEOs are becoming increasingly interested in leveraging data more effectively in their decision-making processes. It used to be fairly simple. You would simply identify your best customers, market like heck to them, and try to maximize the revenue derived from your best customers. Now, what we’re seeing is emphasis on getting the data right and applying analytics to an entire customer base, trying to maximize revenue from a broader customer base. We’re going to talk about a few cases today where entities got the data right, they now serve their customers better, reduced cost at the same time, and increased their profitability. ... We think of IM as having four pillars. The first is the infrastructure, obviously -- the storage, the data warehousing, information integration that kind of ties the infrastructure together. The second piece, which is very important, is governance. That includes things like data protection, master data management, compliance, and e-discovery. The third is information processes. We start talking about paper-based information, digitizing documents, and getting them into the mix. Those first three pillars taken together really form the basis of an IM environment. They’re really the pieces that allow you to get the data right. ... [And, again,] governance processes are the key to everything I talked about earlier -- the pillars of a solid IM environment. Governance [is] about protecting data, quality, compliance, and the whole idea of master data management -- limiting access and making sure that right people have access to input data and that data is of high-quality. Farrell: We recently surveyed a number of data warehouse and BI users. We found that 81 perce nt of them either have a formal data governance process in place or they expect to invest in one in the next 12 months. ... What we’ve seen in the last couple of years is serious attention on investing in that data structure -- getting the data right, as we put it. It's establishing a high level of data quality, a level of trust in the data for users, so that they are able to make use of those tools and really glean from that data the insight and information that they need to better manage their business. ... A couple of years ago, I remember, a lot of pundits were talking about BI becoming pervasive, because tools have gotten more affordable and easier to use. Therefore anybody with a smartphone or PDA or laptop computer was going to be able to do heavy-duty analysis. ... The more effectively you bring together the IT people and the business people and get them aligned, the better the acceptance is going to be. You certainly can mandate use of the system, but that’s really not a best practice. That’s not what you want to do. Esser: Organizations all over the world are struggling with an expansion of information. In some companies, you’re seeing data doubling one year over the next. It’s creating problems for the storage environment. Managers are looking at processes like de-duplication to try to reduce the quantity of information. Farrell: Well, one key example comes to mind. It’s an insurance company that we have worked with for several years. It’s a regional health insurance company faced with competition from national companies. They decided that they needed to make better use of their data to provide better services for their members, the patients as well as the providers, and also to create a more streamlined environment for themselves. ... Another thing that we're doing is working with several health organizations in states in the US. We did one project several years ago and we are now in the midst of another one. The idea here is to integrate data from many different sources. This is health data from clinics, schools, hospitals, and so on throughout the state. It's important to understand and be able to get this data integrated in a meaningful way, because more real-time applications and more mission-critical applications are coming and there is not going to be the time to do the manual integration. ... 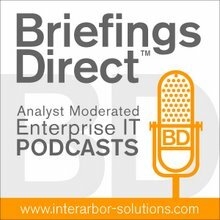 Probably the hottest topic that I have heard from customers in the last year or so has been around the development of the BI competency center. Again if you go to our BI site, you will find some additional information there about the concept of a BICC. We have expertise around several business domains like customer relationship management, risk, and supply chain. We go to market with specific solutions from 13 different industries. As a complete solution provider, we provide everything from infrastructure to financing. Esser: We have a couple of ways to get started. We can start with a business value assessment service. This is service that sets people up with a business case and tracks ROI, once they decide on a project. But, the interesting piece of that is they can choose to focus on data integration, master data management, what have you. Obviously, you can get details on those services and our complete portfolio for that matter at www.hp.com/go/bi and www.hp.com/go/im, as well as at www.hp.com/go/neoview. There is some specific information about the Neoview Advantage enterprise data warehouse platform there.